AlbumExposure is a comprehensive online album proofing solution. Many pros have discovered that its most beneficial feature is that it compresses the workflow process. 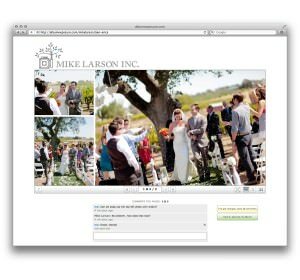 It’s a simple, interactive way for photographers to share clients’ proofs in an album presentation, receive client comments and instructions, make revisions, obtain final approvals and then send albums directly to a printer. You’ll be able to serve more clients during a given period of time and make more sales. 1. AlbumExposure makes the process very easy right from the start, since the system is compatible with any album design software you prefer to use. Generate high-resolution JPEGs, upload them in one group, and then let the AlbumExposure system go to work. It automatically sizes your images according to your presentation design and produces matching thumbnails. 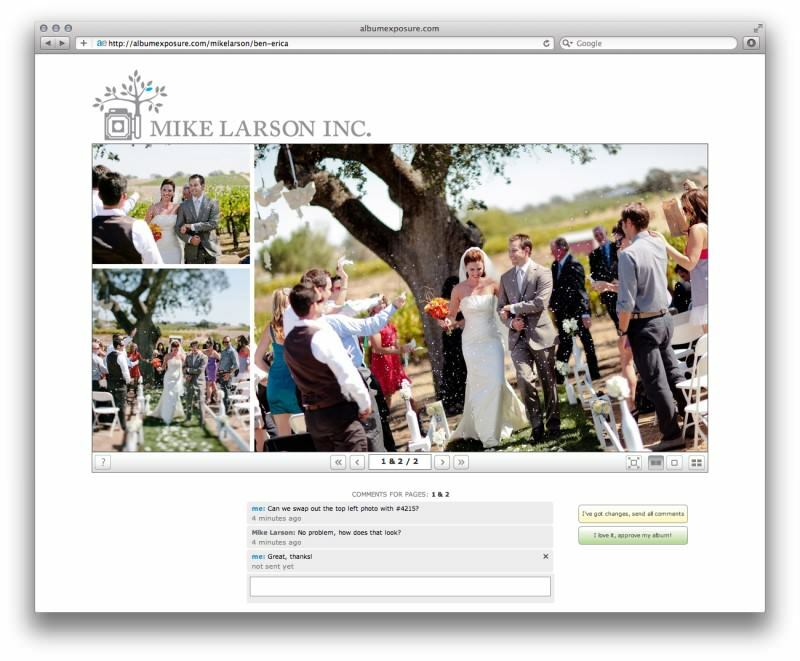 You’re then able to modify your album presentation easily with the drag-and-drop tool. 2. The people at AlbumExposure understand that your online presentations to your clients are also important marketing opportunities. It is equally simple to add your logo and matching background colors, so all your albums are branded exclusively for you. You can even mask the URL so it looks like the album is directly on your website! 3. As a professional photographer, you know that client meetings and communications, although important, are probably the greatest cause of a slow, inefficient and ineffective workflow process. Even with email and smartphones, you spend a considerable amount of time talking with clients and taking notes about their changes and comments. These short, but constant, interactions can disrupt your shooting schedule, which adversely affects profitability. AlbumExposure has addressed this challenge with a clear chat-style method of communicating with your clients. Each page of your online proof has dedicated space for client comments and instructions. You can easily access their feedback and make the changes immediately so their approvals are quicker too. In addition, AlbumExposure emails all client feedback, comments and approvals to you, so you have a separate record. Once you make the changes requested, you can write your feedback in the comments section for your clients to see. Not only does this feature save time, but it also eliminates virtually any possibility for mistakes and/or misunderstandings. This eliminates the need to reprint albums, which can cost photographers a lot of money. 4. The AlbumExposure system is specifically designed for private communications with your clients, but you can also use your final albums to promote your photography business to the world. AlbumExposure will provide you with a public URL allowing you to share your work without client communications revealed. Add your finest albums to your website or blog with a simple embed code. You also have the option of sharing the album on Facebook and Twitter. These promotional features have acted as great tools for selling additional albums to friends and family of the client as well. 5. Your workflow process isn’t completed until your clients’ albums are printed. The AlbumExposure system offers two options: Use your printer of choice or select one of AlbumExposure’s print vendors that have been fully screened for quality production and customer satisfaction. All of them know the AlbumExposure system thoroughly and will likely print and deliver each of your client’s albums faster than your current printer. If your preferred book company isn’t among AlbumExposure’s vendors, that's no problem, just upload your finished album to your album company directly. AlbumExposure's Twitter feed is filled with positive comments from professional photographers just like you. Praise from SCVimagery: @albumexposure is sweet. Not having to make boatloads of pdf album layouts FTW! The cost of subscribing to AlbumExposure more than pays for itself by saving you time and increasing your sales. Think of all the time you can save and how good your brand will look to your clients. Sign up for a free trial with AlbumExposure today!